The most worrying thing about Amr Mostafa isn’t what he says, but that there are numerous others just like him. I stumbled across this blog post. Believe it or not, this person has a decent job and is considered educated. Can you imagine how many others are out there? These are the literate people. Here is a short summary for those who don’t know Arabic and don’t want to be bothered going to google translate, or don’t want to be infuriated. This s a fictional scenario where the owner of the blog imagines meeting some revolutionary friend and opens his mind to the conspiracy theory that the US, Israel and Iran are behind the revolution together with Iran and Israel. He describes revolutionaries as marionettes whose strings are being pulled by foreign agendas. To top this off, he claims that revolutionaries are the ones who killed other protesters and police officers and they are the ones that should be tried. The trouble with the post is that it is so pompous and arrogant, and makes the ignorance all the more painful. To recap, Israel, Iran and the United States all agreed together that the one thing they needed to do was create a revolution. The US backed 6 of April movement and Iran backed the Muslim Brotherhood. Iran, we can understand, but the US and Israel? So, they gave up their greatest ally, Mubarak, because ... he wasn't giving them gas? or because he wasn’t contributing to the Gaza blockade? Or because he was making sure Egypt never does what America tells it to do? Or maybe because we were very advanced in technology and intel and Microsoft were threatened? Or maybe because everyone is jealous of Egypt? These Americans must be stupid to agree with the Iranians, their sworn enemy to remove Mubarak, their greatest treasure. Oh America, it really is a land of opportunity, funding governments and protests against it. I'm glad the April 6 guys extorted them. So the whole revolution was their making, right? They're very clever you know, they killed Khaled Said, forged the forensic reports and insisted that his killers not be tried for murder. They also forged elections as part of the plan to infuriate people. They also put snipers up on rooftops and they were dressed in army clothes that did virginity checks on 19 women and tortured numerous others. They were also in charge of the church bombings of Alexandria on New Year’s and they caused the mass protests against that in Shubra, Mansheyet Nasser and near Maspero. Our government on the other hand, didn't deserve to be pushed out, because it didn't do anything. However some might argue that being incompetent enough to allow ALL of that to happen is reason enough, but no… we’re the marionettes not those taking billions of dollars of funding from the US. Israel infiltrated our policemen too, they sent in the camels, horses, snipers and thugs and we're all marionettes playing to their tune… even our government. Our government tried to warn us you know, telling us these attacks were coming. They couldn’t fend off the Israeli spies on Camels though, that’s why our beloved army was ordered not to interfere. Sometimes I wonder how stupid one has to be not to actually believe this nonsense. I’m an advocate of engaging people with a different point of view and I generally have the patience to hear it out and see things differently. But with such level of insipidness how does one even start? I draw the line when someone is unable to recognize a contradiction, or admit it to themselves. History has a way of changing over time. By the time historians are done with it, it may hardly resemble what really happened. This is not the case for all of history, but perhaps when there is a battle of sorts. The history of our revolution will be written largely depending on the outcome of this war, which we have not yet won. It has taken the regime six months to recover from the devastating blow delivered by the people in the Jan 25 revolution. It was knocked down but not knocked out. It’s up again with full force, responding to our earlier blow. Make no mistake, the SCAF is the backbone of the corrupt regime we continue to live with today. Past regime figures are re-emerging, telling us false tales of what we saw unfold before our eyes. Figures like Osama Saray, the editor and chief of the venomous Ahram, are emerging to tell us fantasies of what they did during the revolution. Hossam Badrawy, briefly head of NDP, is emerging to give us a dramatization of the last days of Mubarak. State Security is working full throttle too. The amount of videos defaming activists and the revolution are increasingly worrying. The media is full of falsified facts accusing April 6 Movement , revolutionaries are being tried in military courts, and there are no signs that the rulers are in any way supporting the values of the revolution. It has taken the regime six months to come up with its version of the truth. Now it’s trying to sell it to Egyptians once again, trying to tell them that what they saw wasn’t true. They’re back there, playing victim. No, it was some foreign hand, they tell us, that caused the revolution as if we had nothing to complain about before it, as though the foreign hands were in charge of corruption, murder and misinformation. They’re trying to tell us that some unknown elements killed protesters, as though Khaled Said wasn’t killed at the hand of the police force, as if the forensic reports were not forged to get the culprits off the hook. They’re trying to tell us Mubarak was in the dark, as if he were not a dictator who ripped the country apart and deprived us of our freedoms. They’re trying to retell the story we just told. They’re trying to take away our victories, as though we’re not entitled to even that. They even want to deprive us of the place that symbolized the collapse of their leader and our dictator. They’re trying to take back everything we gained through truth with their lies. The good news is that we’re fighting back and we’re writing our own history. We hold some ground despite some defeats. We’re still hanging in there. The bad news is that they might succeed in the end. Remember how Mohamed Naguib was erased from history books? Remember how Nasser was glorified? Remember how King Farouk was defamed? The regime might succeed because they control the tools necessary for writing history. They control media, state TV, weapons, books and they have all sorts of powers. We, on the other hand, possess only the truth. But the truth isn’t always enough. The truth needs the tools, needs the medium and it needs belief. Our truth will be buried if we do not fight for it. It seems that those we aimed to bring down are taking credit for the revolution today. They remain at their posts and pretending they revolted against corruption and injustice. We have no choice but to win, because as the saying goes, “He who wins the war, writes the history." But our calls weren’t for elections, they were for democracy and there’s a big difference. Democracy is a way of life, not an action performed once every five years. The answer to my first question: the point at which the revolution became about elections is when we thought we had successfully brought down there regime. The talk became about elections because we thought we had brought down injustice, tyranny, thuggery and gave value to the Egyptian’s dignity. The idea was that there were no more such battles to fight (not so vehemently anyway) and that the military was just an interim ruler with no hidden agenda. It follows that if we have not successfully changed the regime, elections will not guarantee democracy, because they never have. Where have the elections of the old regime got us? One then must establish that the regime is still intact. It seems such a claim hardly need establishment, but for the sake of argument, let’s assume the regime has changed. What are the characteristics of the new regime? How does it differ from the old? Will the changes or similarities guarantee democracy or at the very least free and fair elections? The old regime manipulated state media to spread venomous lies. They censored television programs and newspapers and used their security apparatus to clamp down on anyone trying to disseminate information that threatens the regime. Currently all media is monitored by the current rulers. Anything that may portray these rulers as they truly are is punished, banned or reprimanded. In the event of news that incriminates the army, the presenters are summoned for questioning. How could there be free and fair elections when lies propagated in state media are so predominant? How will Egyptians be informed when rulers are creating news to match their objectives? The old regime clamped down on protests whenever people called for their rights. They made arbitrary arrests through the use of plain clothed thugs and held people in prison without trail under the emergency law. Not only did one experience injustice but one was not allowed to even object to it. There was a constant violation of human rights in all forms. The current regime has gone even further by criminalizing protests. They have arrested protesters and illegally tried close to 10,000 in military courts without a fair trial in just six months. The sentences handed out were up to 15 years. They have tortured protesters and performed virginity tests on female protesters (a form of torture) and have not been held accountable. At the time of writing, CSF and military forces are banning entry to Tahrir, ensuring that the human right of freedom of assembly is violated. The old regime relied on thugs to intimidate and hurt voters and citizens. They always had the backing of a political party that claims the governing of the country is impeccable. Other puppet opposition gave legitimacy to the corrupt state. The events of Abbaseya on 23 July prove without doubt that the rulers are willing to hire more thugs than ever before and even protect them with our armed forces and central security forces. In addition, they created a new way of recruiting citizens to do their dirty work. They spread rumors about unarmed protesters inciting citizens to hurt them or even kill them. These injustices and violations have the support of the foremost, most organized political party today, the Muslim Brotherhood, along with other factions such as Salafis and old opposition. How can we not expect thuggery and intimidation during elections? That is why elections won’t matter. It’s the same system with different players and new labels. If we don’t fight for democracy, elections won’t mean a thing. Seeing Mubarak in a cage, being tried through the will of the people is one of the greatest testimonies to the revolution. Only the most ardent of skeptics could claim that Mubarak would have showed up in court on 3 August if it wasn’t for the 8 July sit-in. It wasn’t the Islamists who came out on a very short burst and went back home before the day’s end, it wasn’t the SCAF who has unjustly tried over 10,000 people in military courts, it wasn’t the passive people who did nothing but criticize. They were the brave protesters of the July 8 sit-in. This is a great triumph for protesters in the face of adversity from the most powerful people in the country. Before seeing Mubarak in court, I hadn’t really cared for what would become of this farcical trial, but then it hit me. We did it; we forced a tyrant into court despite being surrounded with his own people. We fought our way through traps and snares to come out on top. I am still certain that the SCAF has no real intention of brining Mubarak to justice and when the pressure eases, they’ll go back to their old tricks. But we have forced them into this, they can pretend all they want that it isn’t real or that they’re in control, but part of it will always be real. They are now performing to please the crowd. No matter what happens afterwards, we brought a president we deposed to court and we demanded justice. This can’t be taken from us. I must confess the events of the past few days wore me down. I was inclined to let it all go and try the all-comforting blindness of denial. I too can ignore the facts or fit them to my conclusions. I too can fain superiority and pretend to be above it all because both sides are mistaken. I too can condemn without knowing, can pick up and drive to the North coast and pretend that what I believe about the matter doesn’t matter. My deep sorrow resulted from grave injustices experienced around us. It was exacerbated by the smear campaign against the sit-in and protesters. The large show of muscle by Islamists on Friday 29 July, and people’s insistence on not seeing it for what it is, troubled me. I sincerely believed in the 8 July sit-in and felt the demands were necessary to move forward. We were accused, defamed and degraded by people around us. To make matters worse, people cheered as Tahrir square was violently evacuated. At the height of my temptation, I was reminded by a friend what it means to hold on. Without him even knowing how I felt, he sent me a message encouraging me to endure. I was reminded how much comfort I felt being around like minded individuals who held on to the closest thing possible to the truth. I was reminded of the sorrow that fills me when someone gives up on it. The July 8 sit-in triumphed. It brought Mubarak to Cairo in a cage, it pressured the SCAF not to try the protesters it violently evacuated in a military court, it took the moral high ground. At a time when citizens were calling for execution of protesters, the protesters called for fair trials of their oppressors. The difference between citizens and protesters they were mad at was that citizens want selfish forms of justice while protesters want justice for all. At a time when the SCAF were spreading rumors about 6 April and protesters peacefully heading to the Ministry of Defense, the protesters spoke the truth and courageously soldiered on into the venomous trap set up by the SCAF, the police and armed thugs. The protesters proved beyond a doubt they are the better people, not those of the police, not those of the armed forces and not those who do nothing but criticize. If there is one thing I must constantly remind myself of, it’s to choose the right side, not necessarily the winning side. There are far too many people around us that need us to keep the faith and never lose heart. There are so many strangers that are closer to us than people we see every day. We need to hold on to what we feel is right for one another. We must stand for justice when we can, because when injustice catches up with us, others will stand up for us too. We’re in troubling times when things too quickly get too dark, but no matter what, never lose heart. Instead of ranting on about things we don’t know, I’ll list the things we do. There is a great divide within Egypt. The truth is bitter. We’re in the same dictatorship, the Islamic factions are on the rise, people are sedated and revolutionaries are alone yet again. Tahrir has replaced the steps of the journalist syndicate, where a few warriors soldier on and the rest of the people are oblivious to what is truly happening. People are tired; they’ve been dragged into a revolution they could have done without and with the heat, and with Ramadan, the situation has become unbearable. The businessmen are sick of not doing real business, they’re in limbo. If it’s a free market economy, so be it, if it’s a dictatorship, they need to know who’s running the show so they get down to business. The Copts resent the revolution because the Islamists are gaining ground. The Muslims aegypt, life, politicsre sick of what’s become of the revolution because it slows down Islamists from coming to power. The liberals and the leftists want real change and policies that will ensure a democratic process and they are hoping for education to enlighten the people politically. The Islamists are happy to use religion as a political tool to mobilize masses. The SCAF is happy to let the whole thing burn as long as the pay off from Washington to protect Israel’s interests does not stop. This is a great part of the truth, but the divide does not come from the truth, but from denial. There is a denial that prevents real unity. It is those little things around the truth such as intentions and interpretations that are causing the great divide. Let me start with the revolutionaries, as others will take more offence to what I will be pointing out. Public support and international pressure is what aids a sit-in or protest. Without these, there is no winning, especially when up against an army of sinister men. There is great value in resilience, but the environment has to be conducive to this resilience. The lies of State TV work and Egyptians are alienated because of their lack of political foresight. As for the masses, almost everyone knows that the sit-in that started on 8 July has nothing to do with security or our economy, yet many delude themselves into thinking that people there are spies, take money and are the cause of the economic problem. They are in denial that the SCAF is punishing Egyptians for the sit-in and that the regime we aimed to bring down is still alive. Many of the moderate Muslims are in denial that the so called ‘Islamists’ are no representatives of Islam at all. Islamists have proven aggressive, deceitful and have a history of back stabbing anyone they’ve made a deal with. Many tend to forget that the Muslim Brotherhood sold out the Egyptian people to the English back in the day. They tend to forget that Islamic groups pick up arms in order to control other people’s lives. They tend to imagine that a few hundred thousand showed up at different cities at the same time, shouting the same slogans in defiance to prior agreement and left at the same time without it being orchestrated. The Islamic groups being hunted down for ages and imprisoned are in denial that they are supporting the same injustices inflicted upon them. 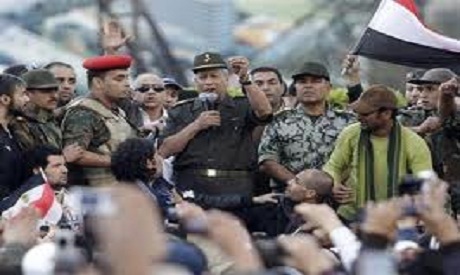 They hail the military ruler whose unjust sentences destroyed the lives of at least 7000 Egyptians from 28 Jan to date. So much more denied, so much more. That is the real reason of the divide. It’s easy to listen to State TV and get the simple convenient lie that everything is fixed. It’s so much easier than finding out the troubling truth by reading between the lines and asking the right questions. It’s much easier to believe that the coming elections will be fair without any real evidence than to imagine the day where everything is bought and rigged again. It’s much easier to believe that our protectors are really protecting us than to believe that we’re being betrayed by corrupt men in uniforms. It’s much easier to believe that those who were hurt deserved it and that it could never happen to you. It’s much easier to believe that you would now be respected in a country that robbed you of dignity, than think that you’re a voice that they want silenced if you speak the truth. It’s easier to believe that others don’t understand things the way you do, and that they’re deluded by one thing or another than it is to carefully examine all the facts and really listen to what others have to say. It’s easy to have beliefs that oversimplify the truth and put your mind to rest, but the easiest of them all is to believe that it’s not your battle, that your choices will not make a difference; that they will do whatever they want anyway. The easiest thing is to believe that speaking up will not change a thing, and that it’s someone else’s responsibility to make things right.